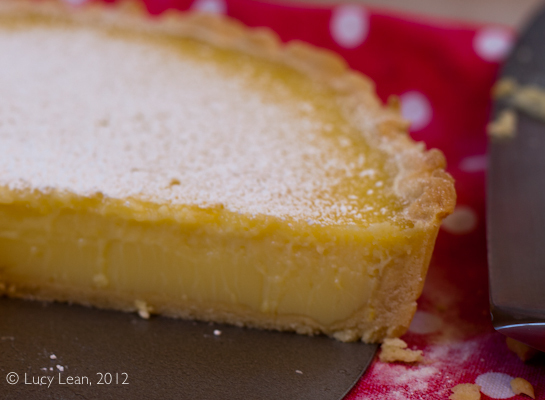 I had every intention of making Papa a Key Lime Pie for father’s day – actually a key lime tart from Francois Payard’s recipe in Made in America. But then reality set in and having made the dough for the crust I had a change of heart – or rather I looked at how to make my friend Anneli’s version of Lemon Tart from Marco Pierre White. This simple easy as pie recipe involves none of the stirring and custard making and bowls over water and tempering and such like that always has me a little frustrated and can be intimidating. 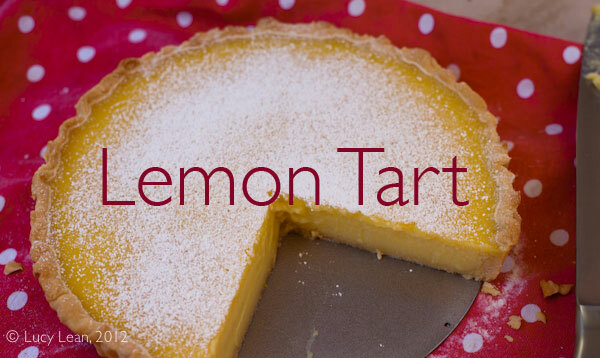 You simply whisk the ingredients for the filling together and pour into the hot tart shell. Anneli makes this tart regularly for dinners and it’s always a huge hit. The story goes this is the tart that she used to win over her husband and his family. Now that I’ve made it up it’s going to be a regular go to dessert for our family. I want to share this with you today just in case you have to take a last minute dessert for a 4th July BBQ tomorrow – it’s a winner on so many levels, not least as Rémy’s all time favorite, but also if you were blindfolded I really don’t think you could tell the difference between the lemon and key limes (especially since in a key lime tart recipe if you substitute regular limes for key limes you need to use 50% lemon juice 50% regular lime juice!). Crust adapted from Francois Payard’s Key Lime Tart recipe in Made in America, lemon filling adapted from Marco Pierre White’s Harvey Tart via Anneli Harvey! 1. Sift together the confectioners’ sugar, flour, and salt into a bowl. 2. Place the butter in a food processor and process until smooth, about 15 seconds. Scatter the flour mixture over the butter; add the egg, and process just until the dough forms a mass; do not over mix. Turn the dough out onto the counter, shape into a disc, wrap in plastic wrap, and refrigerate for at least 2 hours or up to 24 hours. The dough may be well wrapped and frozen for up to 1 month. 3. Let the dough stand at room temperature for 30 minutes to soften. Lightly butter the fluted tart pan with removable bottom. 5. Heat the oven to 325°F. Lightly butter aluminum foil large enough to generously line the tart pan. Line the tart shell with the foil, buttered side down, and fill with dried beans, rice or pie weights. Bake the tart shell for 15 minutes. Meanwhile, start to prepare the lemon filling. 6. Whisk the eggs with the baker’s sugar and lemon zest in a large bowl until smooth. Stir in the lemon juice, then add the cream. Continue to whisk until all the ingredients are thoroughly combined. Skim any froth from the top. 7. Remove the foil and weights and continue baking for 5 minutes, until just set; the tart shells should have little or no color. 8. Reduce the oven temperature 250°F. Pour the cold filling into the hot pastry case (this will insure that the case is sealed). Bake for 40 minutes or until the filling is beginning to set but still wobbles in the center when you move the pan. 9. Remove from the oven and leave to cool and set for about an hour. When ready to serve, sprinkle the tart with icing sugar. Oh, lemon tart! This looks simply divine! You’ve got my mouth watering over here! I wish I was close enough to steal a slice! Yum! wish you were close enough too – I’ll make a tart for you if it means I see you soon?!!! This recipe is such a work of art! Perfect for any special occasion – love it! I’m going to bake this next weekend as mini lemon tarts topped with italian meringue for a 40th, I assume this can just be left at room temp. because it’s been baked… but just double checking so as not to food poison a bunch of people… ? Yes it’s baked so safe at room temp – obviously don’t leave it out for days! Be aware that little tarts will bake much faster and you really want to keep a wobble! Thanks for replying 🙂 They turned out lovely, gone in a matter of 10 minutes… I was lucky to grab one and try it before they were eaten. Delicious, I will definitely make this again, I love how easy everything is to make too, I bet everyone thinks I slaved over it haha.